Friday 26 Apr - The new 2nd generation of the Nexus 7 tablet has now been released and features the new Jellybean 4.3 operating system. 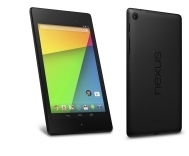 The 2nd generation of the popular Nexus 7 from Google comes with the very latest Android 4.3 operating system which means that there are over 980,000 apps and games available to download. Manufactured by ASUS, the Nexus 7 features a fast quad-core Qualcomm Snapdragon S4 Pro processor and sharp 7-inch display which accommodates a 1920 x 1200 resolution (2.3 million pixels) at 323DPi. Text is razor sharp with videos available to view in full 1080p high definition. The tablet weighs just 290g (0.64lbs) which means it is portable and light enough to take anywhere in small bags with ease. The high capacity rechargeable battery (included) will allow you up to 10 hours of web browsing and 9 hours of HD video playback for your uninterrupted enjoyment. Connect to the internet via wi-fi and hold video conferencing chats with family and friends with the incorporated 1.2 mega pixel front camera and 5 mega pixel auto-focus rear cameras. Again, video is captured in full HD allowing crisp vibrant pictures that captures your valuable memories. Dimensions 200mm Height x 114mm Width x 8.65mm Depth.